What if one were to try and determine the value of gold based on the quantity of money outstanding right now? No one knows where the price of gold is going. It is foolish to even try to predict it in the sense that its value is ultimately determined by the quantity of money outstanding and no one knows where that is going other than UP! What if one were to try and determine the value of gold based on the quantity of money outstanding right now? Many believe that the current currency regime, in effect for 39 years, is failing and will be replaced by something else. The something else is apt to be backed by gold or a basket of hard commodities to prevent politicians from destroying the economy again via credit expansion. The following article attempts to value gold on this basis and comes up with $8,250. Of course, even if the scenario and calculation were correct, by the time it were implemented gold would be worth much more because of the on-going quantitative easing (monetary expansion) underway. This is a very important article for anyone who wants to know what is happening and likely to happen. So is the early Greenspan article that accompanies it. “Stripped of its academic jargon, the welfare state is nothing more than a mechanism by which governments confiscate the wealth of the productive members of a society to support a wide variety of welfare schemes. A substantial part of the confiscation is effected by taxation. But the welfare statists were quick to recognize that if they wished to retain political power, the amount of taxation had to be limited and they had to resort to programs of massive deficit spending, i.e., they had to borrow money, by issuing government bonds, to finance welfare expenditures on a large scale. In the absence of the gold standard, there is no way to protect savings from confiscation through inflation. There is no safe store of value. If there were, the government would have to make its holding illegal, as was done in the case of gold (Ed. – as was done in April 1933). If everyone decided, for example, to convert all his bank deposits to silver or copper or any other good, and thereafter declined to accept checks as payment for goods, bank deposits would lose their purchasing power and government-created bank credit would be worthless as a claim on goods. The financial policy of the welfare state requires that there be no way for the owners of wealth to protect themselves. Greenspan’s views on gold’s relevance then and now cannot be understated. Gold is the sovereign global currency that calls into question the policies, motives and institutional capacity of policy makers overseeing discrete economies with multiple objectives. Unlike paper money contrived and promoted by fiat, gold is no one’s liability. It does not rely on fallacious confidence in ever expanding credit when logic demands otherwise. The world’s most sophisticated thinkers are beginning to conclude that Keynesianism itself is the “barbarous relic”. 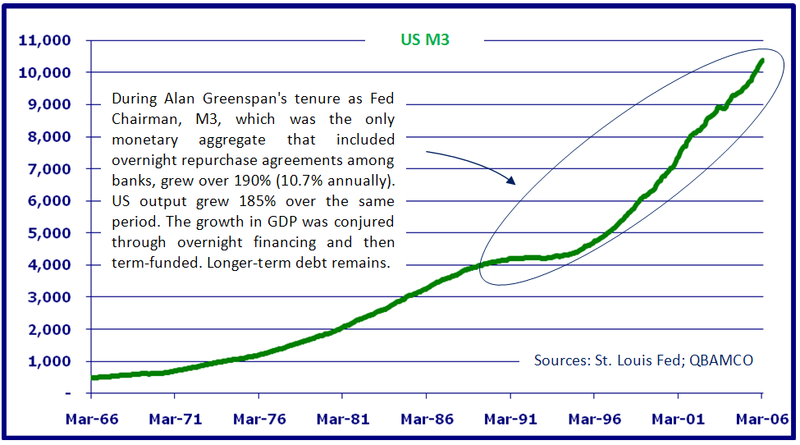 Under Fed Chairman Alan Greenspan, the US banking system expanded overnight borrowing over 10% for ten straight years (M3), which promoted longer-term debt throughout the broader economy. To compete, other established global economies were forced to lever their economies too through money printing and credit extension. By 2007 Western economies had become so levered that the system broke, as it had to. Objective analysts should not expect an orderly unwinding of broad-based consumer credit. By allowing politicians to spend so they could be as short-term popular as they wished, and by permitting banks to lend so they could be fabulously profitable at our risk, the Maestro almost single-handedly transferred wealth from the factors of US production to the nation’s financiers, and in so doing provided the rope now hanging his “welfare state”. It seems Alan Greenspan fancied himself John Galt, the famous Libertarian hero from his friend Ayn Rand’s “Atlas Shrugged”. Quite Schumpeterian, indeed. Gold continues its secular bull market as policy makers continue their rotating currency devaluations. Such trends are signaling the end to a thirty-nine year global monetary system and attempts by its beneficiaries to sustain it. They will lose. Over the last four years we have discussed the inevitability that a new global monetary regime would arise. At first we raised what was then a radical notion as a “possibility”. Gradually we moved further down the line as conditions warranted, now handicapping the odds of a new monetary order as “highly likely”. The pendulum has begun to swing away from a system designed around producing and distributing notional credit towards a system of hard or harder money that flows more efficiently to global resources and factors of production. We believe Western economies cannot climb out of their debt traps through natural economic means. Low levels of capital formation and high levels of consumption, which are pressuring output and employment lower, must be addressed by policy makers or else global economic conditions will continue to deteriorate. We have asserted that the only way such pressures can be relieved is for economies to de-lever – either through painful natural forces or through less painful (and more politically expedient) monetary base inflation (central bank balance sheet expansion or, in the popular vernacular, quantitative easing). We have further argued that the Fed, as the central bank overseeing the benchmark global currency, would ultimately be forced by the markets and politicians to devalue the US dollar versus gold. After a slight refinement in our thinking, we believe we know what policy makers will ultimately do to reset currency values. As you may recall, we developed a Shadow Gold Price (SGP) a few years ago that borrows from the Bretton Woods formula for valuing money in a gold-exchange regime (i.e. the fixed value of a currency equals its outstanding monetary base divided by official gold holdings). Under this formula the exchange rate of the US dollar to an ounce of gold would be about $8,250 presently, a figure that reflects the amount of monetary base inflation already engineered by the Fed. (The US monetary base approximated $2.15 trillion in September and reported official US gold holdings have remained relatively constant at about 8,133.5 metric tons or about 261.5 million ounces.) We approached the SGP from another angle last month and came away with a policy action we believe the markets will begin to discount. The Fed’s September 24 balance sheet reported the value of its “Gold Certificate Account” to be worth $11.037 billion, a figure that implies the Fed has claims on the US Treasury’s entire stock of gold and that it is carrying those claims on its balance sheet at Treasury’s official gold price — $42.22/oz ($11.037 billion divided by 261.5 million ounces). Upon reflection we concluded that this particular line-item has significant ramifications for the “solvency” of the Fed’s balance sheet: The Fed has the freedom to unilaterally redefine monetary terms. It can claim gold from the Treasury with which to reconcile past monetary base inflation and it can fully-reserve dollar-denominated debt merely by re-pricing the gold on its balance sheet. This matters. The Fed cannot go bankrupt despite whatever dubious debt it assumes on its balance sheet (such as toxic mortgages). Further, it can revalue gold higher in US dollar terms to adjust for bad debt within the banking system – even if all of it were re-marked to zero. With the Gold Certificate Account, the potential aggregate value of the Fed’s assets is sufficient to pare-off against all systemic dollar-denominated debt. The Fed may unilaterally de-lever the US economy and re-gain control of global monetary policy anytime it wishes. In light of this there are three key issues to consider. First, the mere revaluation of gold on the Fed’s balance sheet would not be inflationary or deflationary because the monetary base would stay constant in nominal terms. The Fed could simply re-value gold as an asset on its balance sheet without expanding or contracting the money stock (the notional value of its liabilities). Second, were the Fed to revalue its Gold Certificate Account to about $8250/oz, it would establish a sustainable gold/dollar exchange value that the Fed would be able to manage. Third, there is no mechanism to constrain the price that the Fed may choose to devalue the dollar to gold (only a market-based constraint). We expect that at some point the Fed will devalue the dollar vis-à-vis gold and then begin conducting open market operations that targets a dollar/gold exchange ratio. This is not a radical notion; in fact it would be a return in large measure to the pre-1971 global monetary system. The act of targeting a dollar/gold exchange ratio would literally be a monetary authority conducting monetary policy again, whereas targeting overnight interest rates over the last generation has, in reality, been tantamount to a banking regulator conducting very easyunreserved credit creation policy. Should the Fed wish to stimulate the economy under a dollar/gold-exchange system, it would enter the market as a net buyer of gold, thereby expanding the monetary base. Or, it could restrict growth by selling its gold. Each ounce purchased from the Fed would expand the monetary base by $8250 and vice versa. Holders of gold at that point would presumably be wealth preservationists (i.e. savers). Alternatively, holders of gold at today’s nominal valuation around $1,300/oz would clearly receive an unencumbered windfall in purchasing power (and are thus investors). The markets seem to have begun to discount such an eventuality as it becomes more obvious that the economic efficacy of targeting interest rates has been severely compromised. The global financial system yearns for more cash, not more credit. • Gold is discounting and predicting necessary and ongoing financial system deleveraging. It is not predicting rising or falling prices per se. • While not nearly as clear under a fiat currency regime, a rising gold price signals deleveraging of the banking system via an ongoing and aggressive expansion of the global monetary base. • Gold’s only function is as a currency that competes with dollars, Euros, Yen, etc. Gold has been rising in paper money terms for ten years because wealth holders around the world are increasingly seeing it as a more stable currency than their local currencies. • Gold is a more stable currency than paper monies because it is scarcer; annual demand for gold exceeds its production, which is not the case with paper money and credit production. • US “dollars” are actually Federal Reserve Notes, backed since 1971 only by the Treasury’s promise that the Fed will manufacture more of them to meet demand. • Demand for dollars increases not only with increasing demand for goods, services and assets relative to their supply, but also with increasing demand for tax payments and repayment of unreserved public and private sector debt obligations. • When the amount of credit outstanding rises in relation to the amount of paper money in which it is denominated, more paper money must be manufactured to satisfy such claims. As the gap separating outstanding money and credit widens, the production of money that must be manufactured to satisfy those claims begins to overwhelm more organic supply/demand functions in the economy. • Currently, there is at least $70 trillion of dollar-denominated debt on which about $2.2 trillion exists from which to repay that debt. So, the demand for quantifiable claims on future money is increasing (i.e. bond prices are rising and interest rates are dropping). • The more pressure on debt to decrease in value (deflate) due to debtors’ growing inability to repay their obligations (from having been crowded out of having enough money with which to repay it), the more likely the world’s central banks will create new money (inflate) with which to repay it. The alternative would be rising unemployment and contracting economic growth. Thus, we can have debt deflation and monetary (base) inflation at the same time. In fact that is precisely what is occurring today. • After 25 years of a credit build-up, Western economies entered the de-leveraging phase of the economic cycle in 2007. • Systemic deleveraging can occur in two ways: 1) organic nominal debt deleveraging, which wipes out lenders (banking system and bond holders) in nominal terms or, 2) central bank administered debt deleveraging via the dramatic expansion of money, which wipes out lenders in real terms.Gold’s performance is positively correlated to the latter. • The top priority of US economic policy makers across the political spectrum since 1971 has been to maintain the hegemony of the dollar-based global monetary system, which allowed the US to manage global pricing and resource distribution. To do this, policy makers have had to marginalize the one competing currency capable of displacing it: gold. We think the 39-year run using the US dollar as a surrogate for gold is in the process of being replaced by natural economic forces. Western policy makers cannot control this change and the consequences of this shift on paper-money denominated savings and asset values should be profound. It still appears to be early. We think many more investors will commit to gold before all is said and done, and this is when the final phase of the precious metal bull market will begin in earnest. Judging by the still very low public participation in precious metals markets and related plays to date, (despite all the chatter), Western investors remain formally committed to levered financial assets sponsored by levered investors. For now, global wealth and encumbered assets posing as wealth have not yet converted to precious metals or finite resources in any meaningful way. Investors thus far have begun to minimize “risk”, as it is generally perceived, by reducing exposure to corporate shares and consumable commodities. Ironically they have sought “safe havens” such as cash and bonds. There is risk here in real terms. As the Eagles said, “every form of refuge has its price”. Risk is not in the asset — it’s in the currency. Stock prices (or any price for that matter) are not absolutes. They are exchange ratios. The numerator of the ratio is unit of account (e.g. the US dollar) while the denominator is one share of stock. Thus, it is not only share values moving per se but the unit of account in which they are denominated. To isolate the merits of “stock-picking” then, one must manage the equivalent of a “long/short” position whereby the value of the unit-of-account is sterilized. Fund managers that presume they are investing in a stable currency market are missing most of the game. The vast majority of economic policy makers across the political spectrum have been instructed in the Keynesian tradition. Like it or not, Keynesianism presupposes that public policy is necessary to quell or promote animal spirits by directing capital formation within an economy. As investors, it is not our place to pass judgment about the merits or failings of policy intervention. However we think there are certain indisputable aspects of ongoing government involvement in economies that are predictive and thus valuable, chief among them that policy makers must be reactionary. ‘The paycheck cycle we’ve talked about before remains extreme. It is our responsibility to figure out how to sell in that environment, adjusting pack sizes, large pack at sizes the beginning of the month, small pack sizes at the end of the month. And to figure out how to deal with what is an ever-increasing amount of transactions being paid for with government assistance. From an economic perspective, the political class is failing societies — depending on your politics either by intervening too much or by ineffective intervention. All should agree that the level of past intervention is woefully inadequate to accomplish Keynesian goals. US monetary and fiscal policy makers are weighed down by two basic realities: 1) the self-imposed burden of having to provide solutions for domestic imbalances while appearing hegemonic to the rest of the world, and 2) the political reality that change must come in small doses. These realities provide investors with a sound metric for defining market inefficiencies. Pronouncements emanating directly from policy makers, (or ascribed to them by media fearful of losing access to them), should be ignored if they do not square with political realities. We know that policy makers will always project an air of control, even when economic cycles, balance sheets and economic incentives are irreparably impaired. We think the safest assumption is that politicians and policy makers will continue playing small ball, blaming each other and actual economic participants for structural deficiencies. Meanwhile, the gap separating economic reality and baseless happy talk will continue to widen and economic and market outcomes will become even more predictable. A small but growing group of observers are beginning to recognize this gap. Some economists, for example, are beginning to view the breakdown in tried and true economic relationships as “disequilibria”. How else could they explain progressively easier monetary policies concurrent with stubbornly lethargic output growth and high unemployment? We think the handful of economists that have acknowledged this “disequilibria” and the vast universe of policy makers that have not acknowledged it yet are generally unwilling to address the fundamental cause of the breakdown: suffocating debt and the need to de-leverage economies. When viewed through this prism, there are no strict economic disequilibria. There is only proof that past and current explanations for economic relationships and public policies have been incomplete. In a nutshell, economic orthodoxy in the West no longer solves for incentives that seek to produce capital and sustainable resources. As a result, public economic policy does not solve for producing sustainable real economic growth and investors no longer solve for obtaining positive real rates of return. Since 1971 Western economic policy has allowed central banks and their banking systems to create and distribute money and credit in limitless amounts so that public and private balance sheets could grow in nominal terms (bigger numbers, not more value). The emphasis of economists and policy makers migrated from debating how to optimize the efficient allocation of resources to debating how the economy could produce and distribute more money. The debt that was created finally came to overwhelm the resources and real factors of production that supported Western economies, yet most experts continue to see the light in the tunnel as an exit, not a train. In a world where there is thirty times more debt than money and bank reserves, the demand for money is sensibly growing far faster than the demand for encumbered financial assets (thus, the strong bid for bonds offering defined future cash flows). Policy makers will continue buying debt and manufacturing money to do so. Their QE will lag the demand for money because anything else would make them appear to be panicked. Their show of “judiciousness” will not work because economies and markets are in a state of disequilibria. Buying debt with new debt (paper money) will not de-leverage the system. Buying unlevered assets would de-leverage the system. We think we know what asset they will come around to. When banks loan money to finance productive and profitable endeavors, the loans are paid off rapidly and bank credit continues to be generally available. But when the business ventures financed by bank credit are less profitable and slow to pay off, bankers soon find that their loans outstanding are excessive relative to their gold reserves, and they begin to curtail new lending, usually by charging higher interest rates. This tends to restrict the financing of new ventures and requires the existing borrowers to improve their profitability before they can obtain credit for further expansion. Thus, under the gold standard, a free banking system stands as the protector of an economy’s stability and balanced growth. When gold is accepted as the medium of exchange by most or all nations, an unhampered free international gold standard serves to foster a world-wide division of labor and the broadest international trade. Even though the units of exchange (the dollar, the pound, the franc, etc.) differ from country to country, when all are defined in terms of gold the economies of the different countries act as one – so long as there are no restraints on trade or on the movement of capital. Credit, interest rates, and prices tend to follow similar patterns in all countries. For example, if banks in one country extend credit too liberally, interest rates in that country will tend to fall, inducing depositors to shift their gold to higher-interest paying banks in other countries. This will immediately cause a shortage of bank reserves in the “easy money” country, inducing tighter credit standards and a return to competitively higher interest rates again. But the process of cure was misdiagnosed as the disease: if shortage of bank reserves was causing a business decline – argued economic interventionists – why not find a way of supplying increased reserves to the banks so they never need be short! If banks can continue to loan money indefinitely – it was claimed – there need never be any slumps in business. And so the Federal Reserve System was organized in 1913. It consisted of twelve regional Federal Reserve banks nominally owned by private bankers, but in fact government sponsored, controlled, and supported. Credit extended by these banks is in practice (though not legally) backed by the taxing power of the federal government. Technically, we remained on the gold standard; individuals were still free to own gold, and gold continued to be used as bank reserves. But now, in addition to gold, credit extended by the Federal Reserve banks (“paper reserves”) could serve as legal tender to pay depositors. When business in the United States underwent a mild contraction in 1927, the Federal Reserve created more paper reserves in the hope of forestalling any possible bank reserve shortage. More disastrous, however, was the Federal Reserve’s attempt to assist Great Britain who had been losing gold to us because the Bank of England refused to allow interest rates to rise when market forces dictated (it was politically unpalatable). The reasoning of the authorities involved was as follows: if the Federal Reserve pumped excessive paper reserves into American banks, interest rates in the United States would fall to a level comparable with those in Great Britain; this would act to stop Britain’s gold loss and avoid the political embarrassment of having to raise interest rates. The “Fed” succeeded; it stopped the gold loss, but it nearly destroyed the economies of the world, in the process. The excess credit which the Fed pumped into the economy spilled over into the stock market, triggering a fantastic speculative boom. Belatedly, Federal Reserve officials attempted to sop up the excess reserves and finally succeeded in braking the boom. But it was too late: by 1929 the speculative imbalances had become so overwhelming that the attempt precipitated a sharp retrenching and a consequent demoralizing of business confidence. As a result, the American economy collapsed. Great Britain fared even worse, and rather than absorb the full consequences of her previous folly, she abandoned the gold standard completely in 1931, tearing asunder what remained of the fabric of confidence and inducing a world-wide series of bank failures. The world economies plunged into the Great Depression of the 1930?s. With a logic reminiscent of a generation earlier, statists argued that the gold standard was largely to blame for the credit debacle which led to the Great Depression. If the gold standard had not existed, they argued, Britain’s abandonment of gold payments in 1931 would not have caused the failure of banks all over the world. (The irony was that since 1913, we had been, not on a gold standard, but on what may be termed “a mixed gold standard”; yet it is gold that took the blame.) But the opposition to the gold standard in any form – from a growing number of welfare-state advocates – was prompted by a much subtler insight: the realization that the gold standard is incompatible with chronic deficit spending (the hallmark of the welfare state). Stripped of its academic jargon, the welfare state is nothing more than a mechanism by which governments confiscate the wealth of the productive members of a society to support a wide variety of welfare schemes. A substantial part of the confiscation is effected by taxation. But the welfare statists were quick to recognize that if they wished to retain political power, the amount of taxation had to be limited and they had to resort to programs of massive deficit spending, i.e., they had to borrow money, by issuing government bonds, to finance welfare expenditures on a large scale. Under a gold standard, the amount of credit that an economy can support is determined by the economy’s tangible assets, since every credit instrument is ultimately a claim on some tangible asset. But government bonds are not backed by tangible wealth, only by the government’s promise to pay out of future tax revenues, and cannot easily be absorbed by the financial markets. A large volume of new government bonds can be sold to the public only at progressively higher interest rates. Thus, government deficit spending under a gold standard is severely limited. The abandonment of the gold standard made it possible for the welfare statists to use the banking system as a means to an unlimited expansion of credit. They have created paper reserves in the form of government bonds which – through a complex series of steps – the banks accept in place of tangible assets and treat as if they were an actual deposit, i.e., as the equivalent of what was formerly a deposit of gold. The holder of a government bond or of a bank deposit created by paper reserves believes that he has a valid claim on a real asset. But the fact is that there are now more claims outstanding than real assets. The law of supply and demand is not to be conned. As the supply of money (of claims) increases relative to the supply of tangible assets in the economy, prices must eventually rise. Thus the earnings saved by the productive members of the society lose value in terms of goods. When the economy’s books are finally balanced, one finds that this loss in value represents the goods purchased by the government for welfare or other purposes with the money proceeds of the government bonds financed by bank credit expansion.